There are several viewpoints that are currently being circulated about these two charts today. In the one that is promoted by the majority of the theologians and scholars of the Seventh-day Adventist church, they hold up the 1863 prophecy chart as the foundation of all Adventist belief and evidence that the 2520 prophecy is a false prophecy because they claim that it has been removed from the 1863 chart. In the other viewpoint that is starting to be promoted by those who believe in the validity of the 2520, they claim that since the Laodicean message came into prominence in the mid-1850's that means that the 1863 prophecy chart was made out of rebellion against God, and that we should not use the 1863 chart. However, I would like to take a look at the 1863 charts a little closer, because from my studies, I believe that both of these viewpoints are wrong! They are the ditches on both sides of the road. Each one of these groups is, from what I have studied, throwing the baby out with the bathwater, so to speak. First of all, even though the 2520 is not listed on the 1863 chart as the figure "2520" - it is still shown on that chart as the "One Week" from 27 ad to 31 ad, divided into two 3.5 sections. The "One Week" which is 7 literal years is literally 2520 literal days and it is divided in half into two 1260 day periods. It is also revealed, though not mentioned by the figure "2520", in the book of explanation with the starting dates and ending dates still shown. In other words, the 1863 prophecy chart, contrary to what some officials of the church would like to believe, literally proves the validity of the 2520 prophecy! When you study into the 2520 and begin to understand the many implications, details, and parallels of the 2520, you will begin to see some of the many connections that the 2520 has with the 1863 chart. Second, Sister White gives very powerful endorsement for the 1843 and 1850 charts - that they were directed by God! She also specifies that the time period of the early 1840's is where the foundation of the church was laid. And while it is true that she does not give such strong endorsements for the 1863 charts as she does for the first two, she does endorse and promote them. This shows that she does approve of them, for if you do not approve of something, you should not endorse it. Third, in order to understand the significance of these charts, we should look at the parallel between Israel and the Seventh-day Adventist church. What event or time period of Israel's history parallels our church in 1863? Israel was called out of Egypt - Seventh-day Adventists were called out of the world. Israel and Adventists both experienced disappointment. And Moses said, Eat that to day; for to day is a sabbath unto the LORD: to day ye shall not find it in the field. 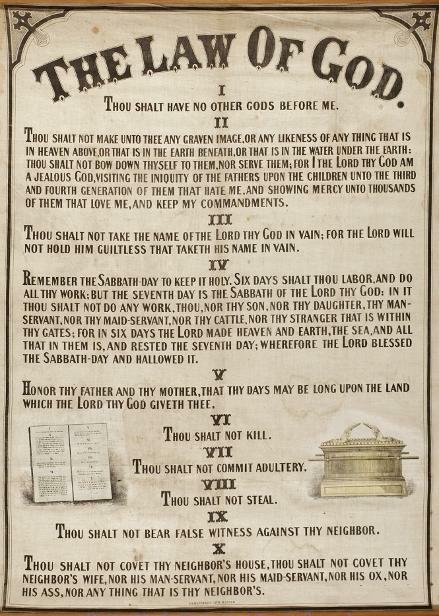 Six days ye shall gather it; but on the seventh day, which is the sabbath, in it there shall be none. At Mount Sinai Israel was given the Law of God, the Statutes and Judgments that help explain the Law and that Moses wrote down in a book, the laws on health, and the sanctuary structure. At this point, Israel was denominated! In 1863, Seventh-day Adventists were given the Law of God chart and the 1863 prophecy chart with the explanations being written in a book, they were also given the health message, as well as the church's organized structure. At this point, Seventh-day Adventists became denominated! What I want everyone to understand is that the events of 1863 parallel the children of Israel at mount Sinai. Yes, the Laodicean message was begun to be preached as early as the mid 1850's, and yes, our people were in the Laodicean condition in 1863 (just as they are now) - but look at Israel. Israel had begun to murmur and complain before they got to Sinai. Then at Sinai, they were in open rebellion, even making a golden calf and worshipping it. But just cause the majority of Israel was in rebellion, does not make the Law of God, the Statutes and Judgments, the health laws, and the sanctuary structure an act of rebellion - any more than, in 1863, the majority of our people being in a lukewarm Laodicean condition makes the Law of God and Prophecy charts or organization of the SDA church an act of rebellion. God gave the Law, Statutes, Judgments, health laws, and sanctuary structure to rebellious Israel for the purpose of leading them back out of rebellion and fitting them to enter the promised land. And it is the same with the charts - God gave us each of the charts (All Four), the organization, and the health message, for the purpose of leading us out of our Laodicean condition and fitting us to enter the heavenly promised land. In fact, I have found that none of the charts can "totally" be understood, if you reject the others. Each one of the charts is a key that unlocks some of the symbolism of the other ones! One thing that I learned years ago, when you see something that doesn't look normal - Ask Why? You see, if you look at the 1863 prophecy chart and compare it with the 1850 chart, you will notice some differences. The question to ask, is "Why?" What is God trying to tell us by the differences? First of all, there are timelines on the 1863 chart that are not drawn on the 1850 chart. 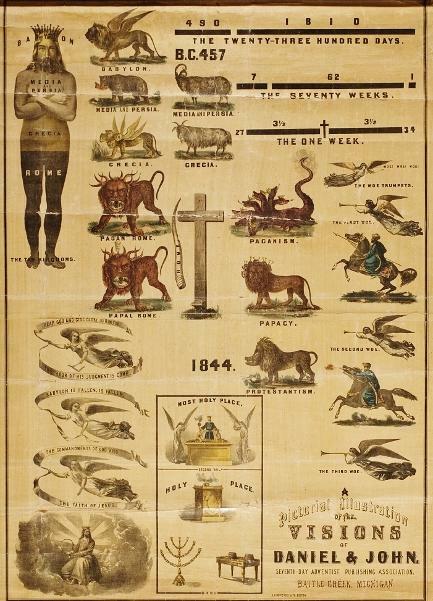 The 70 weeks prophecy is only mentioned on the 1850 chart, but not drawn out; and the one week prophecy is not shown on it either - but both prophecies are very prominent on the 1863 chart. You will notice that the prophetic timelines that are shown on the 1863 chart are the prophecies that deal specifically with Christ - His ministry on earth, and His ministry in heaven! The testimony of Jesus Christ. Also notice that on both the 1843 and 1850 charts, there is shown Christ being sacrificed on the cross (the pagan symbol for Tammuz) - but on the 1863 chart, Christ is no longer being sacrificed. Again - Why? Let me share with you why I believe these differences are placed here. And I will tell you up front - I do not believe in "Coincidence!" On the 1843 chart, the 1st and 2nd angels messages of Rev. 14 are illustrated. On the 1850 chart, there is the addition of the 3rd angel's message of Rev. 14. But notice that even though the 3 angels messages are shown on the 1850 chart - there is a line separating the third angel from the other two. But then, when you come to the 1863 chart, the 3 angels are combined together as one! I believe that this chart is revealing something about the 4th angel of Rev. 18 - which is a combination of all three angels of Rev. 14. But there is a lot more yet! The image in the top left corner is a portrayal of the image of Daniel 2 that shows the deterioration of the four kingdoms, and beside it are the four beasts that reveal the same thing. If the image represents both the deterioration of the kingdoms and of religion - then the four beasts must also represent the same. 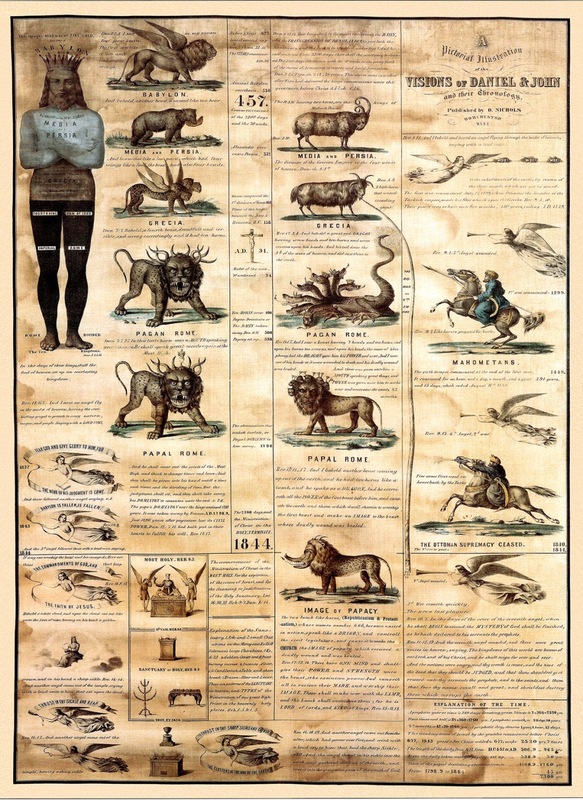 You will notice that on both the 1843 and the 1850 charts, the four beasts that represent the four kingdoms are facing to your right - but on the 1863 chart, they have turned around facing toward your left. In other words, the 1863 chart is illustrating a "turning point" in the history of the nations and the church. You will also notice that there is no incense rising from the Altar of Incense on the 1850 chart, but there is a cloud of incense shown on the 1863 chart. The incense was a representation of the prayers of God's people. In other words, the turning point illustrated on the 1863 chart is something that happens in connection with the prayers of the saints ascending to the Most Holy Place of the heavenly sanctuary (the praying for the Holy Spirit). And whatever this turning point is, it also shows a change where Christ, who has been being sacrificed (figuratively) is now no longer being sacrificed! This turning point is also somehow connected with the fall of Babylon. I will add more later when I get a chance, because I could write a whole book just on the symbolism and the significance that I have found in comparing these 4 charts! They reveal a lot more than we thought they did! But for now, I'll let you study it for yourself. So get out your 43, 50, & 63 charts and start studying - they reveal the key to finishing the work so that Christ can return!! Another false doctrine that is sweeping the world today, is a misunderstanding about the Godhead. This theology is being connected with some who are promoting the charts. People are wanting to promote the teaching of the "Trinity" - but they don't understand the issue correctly! This is a presentation exposing this vitally important topic!